Dubai is becoming an increasingly popular holiday destination for travellers from all over the world due to the fantastic weather, stunning architecture and fascinating culture. Dubai is situated within The United Arab Emirates (UAE) The UAE consists of seven Emirates of which Dubai is the second largest and the most popular. Dubai is located on the southern shore of the Persian Gulf on the Arabian Peninsula and is often referred to as the 'Pearl of the Persian Gulf'. Dubai is arguably one of the most innovative cities in the world boasting stunning architecture including the world's current tallest building, the Burj Dubai and what is soon to be the most technologically advanced building in the world, the pad. The technological advances of this city is in stark contrast to the traditional Islamic culture that is still evident throughout however the two fuse together seamlessly to create what is inarguably a magnificent city. While visiting Dubai there are endless things to keep you entertained, such as shopping centres, busy souqs, golden beaches and world class sporting facilities that attract golfers from all over the world. 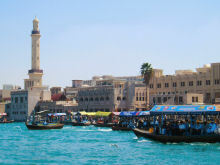 Points of interest include the Grand Mosque, which is situated on the Bur Dubai side of the creek, a river that runs through Dubai dividing it into what seems like two different cities. The Grand Mosque was re-built in 1998 and boasts more than 50 domes, stained glass panels and a 70 metre high minaret. Dubai is well down for its luxurious hotels including the Atlantis and the Burj Al Arab, which is unofficially known as the world's only seven star hotel. 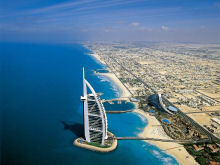 The Burj Al Arab is built on an artificial island and has a sail-shaped build reaching out at 321m. The hotel features a sky view bar with amazing views so if you don't suffer from vertigo it's certainly worth a look. Dubai has excellent sporting facilities for those wishing to get active boasting Dubai Sports City, an institution hoping to host the Olympic games in the future. Sports and activities available include golf, camel racing and a Formula 1 autodrome. The miles of sandy beaches also offer a variety of water sports such as snorkelling and sailing. Dubai has been labelled as the shopping capital of the Middle East and is home to numerous modern shopping malls and traditional souqs. Popular items include unique jewellery, electronics and clothing, all of which can be found under one roof in a number of the shopping centres. 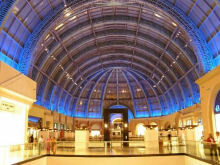 The Ibn Battuta Mall is the most unique mall in Dubai and perhaps the world, the centre is separated into six different themes from the countries Ibn Battuta travelled to, and these include China, India and Egypt. 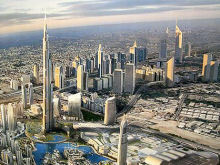 DialAFlight offer flights to Dubai from £199 return (including taxes). When you are visiting Dubai you can also check for hotels in Dubai at Hotels.com for a selection of prices and locations to meet your specific needs.